The exhaust system protects the environment and your family from harmful gases. In addition, everything from the bends in the pipe to the precious metals in the catalytic converter make the exhaust system an essential part of the performance of your engine. Top Value muffler and exhaust technicians have been trained on the latest technologies and can advise you on everything from performance headers to mufflers to chrome pipes. That is why you should only trust your exhaust repairs and performance enhancements to one of Top Value’s certified technicians. 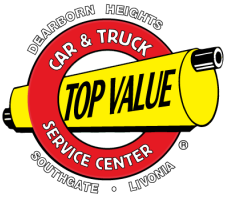 Visit our main locations in Livonia, Dearborn Heights and Southgate or any one of our other convenient auto repair and muffler shops.